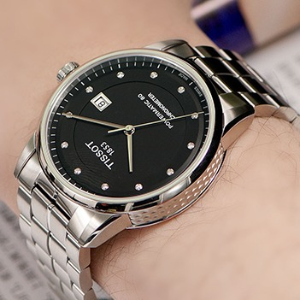 JomaShop.com offers the TISSOT Luxury Automatic Black Dial Men's Watch T086.408.11.056.00 for $399 via coupon code DMOON2TIST20 . Features: Stainless steel case with a stainless steel bracelet. Fixed stainless steel bezel. Black dial with silver-tone hands and diamond hour markers. Minute markers around the outer rim. Date display at the 3 o'clock position. Powermatic 80.111 automatic movement with an 80-hour power reserve. Scratch resistant sapphire crystal. Skeleton case back. Case size: 41 mm. Case thickness: 9.75 mm. Water resistant at 50 meters / 165 feet.